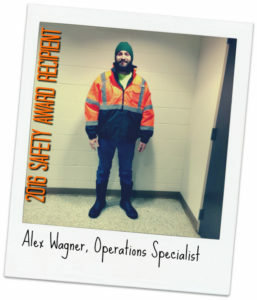 2016 Safety Award | Infrastructure Alternatives, Inc.
Operations Specialist Alex Wagner is exceptionally dedicated to safe work practices, according to his supervisor. Brighton Township WWTP Plant Manager Tom High says that he nominated Alex for IAI 2016 Employee Safety Award, not because of one specific action, but because of his day-to-day performance. Tom says that Alex’s attention to safety is consistent and thorough, and is carried through, from the initial planning of a task, through completion. The IAI safety award committee wholeheartedly agreed with Alex’s supervisor, and selected Alex to receive the 2016 Employee Safety Award. Alex’s dedication to working safely, with methodical forethought and caution, is a model for our entire team. His approach to safety is a great example of the IAI commitment to excellence. Alex serves as an Operations Specialist for IAI at the Brighton Township Wastewater Treatment Plant, in Brighton, Michigan. He has been a member of the IAI team for two years. Alex received a new high visibility jacket to commemorate his award (pictured). Congratulations, Alex, and keep up the great work!